Buckeye Partners, LP (BPL) is a Master Limited Partnership, or MLP, that was founded in 1986. MLPs are tax-advantaged investment vehicles known for their high payout ratios. MLPs are typically in the energy pipeline industry, and Buckeye Partners is no exception. In the past 30+ years, Buckeye Partners has grown to operate a diversified network of midstream logistics assets, which it uses to generate income via fees collected from its domestic and global terminals. Its revenue mix consists of gasoline (~50%), jet fuel (~25%) and distillates (~25%). Units have traded lower recently due to a variety of factors – including concerns over distribution coverage – but with a 14.2% yield and trough valuation, we see Buckeye as a buy today. The company’s recently report Q1 earnings showed that it continues to struggle with “challenging market conditions”, as management so eloquently vocalized during the report. 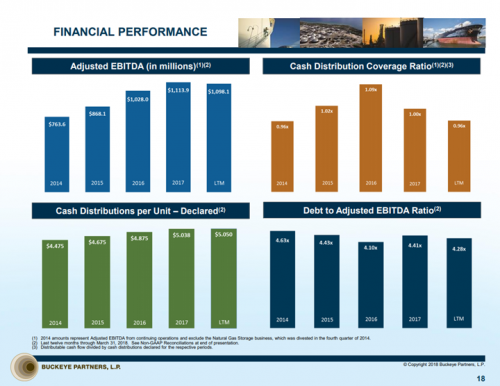 Its adjusted EBITDA fell 6% against the comparable quarter last year while its outstanding unit count rose 6%. That created a situation where EBITDA-per-unit fell in the double digits, something which investors didn’t take kindly to. Buckeye used the additional funding for part of the relatively recent VTTI merger, as well as some capital expenditure funding for 2019 projects. Utilization also fell year-over-year, moving down from nearly 100% to just 88% in Q1. Buckeye has a few levers it can pull to grow in the coming years, and we think these will be enough to not only cover the distribution, but continue to grow it as well. Since 2010, the company has acquired more than 75 additional terminals, adding 130M barrels of capacity as well as creating seven hubs in its system. This has also produced the benefit of diversifying its EBITDA, as it now sees about 70% of its EBITDA come from refined products, a metric that used to be close to 100%. Buckeye now boasts more than 6,000 miles of pipeline and over 100 delivery locations. In addition, it has 170 million barrels of liquid petroleum storage capacity. That has been an issue of late as the crude oil market has swung into backwardation, a condition where spot prices are greater than in the futures market. When this occurs, demand for storage falls and as a result, Buckeye’s utilization declines. However, this is not a normal condition and we expect this to be a temporary headwind for Buckeye. Buckeye has grown its EBITDA-per-unit at an average rate of about 6% in recent years and we believe it will be able to continue to do so. Its pipeline and storage assets should see stronger demand moving forward, following this period of weak utilization, and we therefore believe investors have sold the units off more than is warranted. Temporary weakness in Buckeye’s business is affording investors the chance to buy a great company at a sizable discount. Buckeye’s main source of growth will be higher utilization, which should also lead to higher margins. Operating margins have fallen materially of late given that lower fees from weak utilization have deleveraged fixed operating costs. This condition should abate when demand returns, and we are optimistic Buckeye will start growing again soon. To be fair, Buckeye does issue new units periodically to pay for a variety of items, including acquisitions as well as the distribution. Its unit count is about 250% higher than it was ten years ago, diluting existing unit holders and keeping a lid on profit growth on a per-unit basis. However, management has stated no further issuances are needed through 2019, so a meaningful reprieve from such activity is coming. Buckeye’s valuation has moved much lower recently, such that it is trading for just 5.3 times our 2018 EBITDA estimate of $6.77 per unit. Our estimate of fair value is 7 times EBITDA, meaning that Buckeye is very cheap here. Indeed, its historical average multiple is 8.2 times EBITDA, but we recognize Buckeye has some short-term challenges that may keep a lid on the valuation for some time. Still, the units offer new shareholders significant value here, and we see a tailwind of 5.7% annually as a result. In addition, the cheaper units have afforded Buckeye an enormous yield, which is in excess of 14% today. The units typically yield about half that value – around 7% – so Buckeye is truly offering significant value today. Concern over distribution coverage has been among the reasons investors have sold the units of late, but we see these concerns as unfounded. Distributable cash flow fell 11% in Q1, but management has proven it is willing and able to defend the distribution at all costs. In other words, we do not see cutting the distribution as a realistic possibility here. Distribution coverage was 91% in Q1 but the forecast for the full year was 95%. Indeed, Buckeye has seen periods of sub-100% distribution coverage before and it has never cut the distribution. Finally, management forecasts higher tariffs in 2019 and beyond as well as gains from its capital projects that are in-progress today, meaning weakness in distribution coverage should be temporary. This slide shows that Buckeye’s recent deterioration in financial performance is noticeable, but hardly disastrous. Adjusted EBITDA for the last twelve months is near 2017 levels and in excess of 2016 by a meaningful margin. In addition, its distribution coverage is only slightly below 100%, which is where it was back in 2014 as well. Debt is still in-line with historical norms as well and the distribution continues to grow. To put it bluntly, we do not believe investors have anything to worry about and that the selloff in the units has taken slight declines in the fundamentals well out of proportion. We see Buckeye as a strong buy at today’s price. The fundamentals have deteriorated slightly but there has been a huge decline in the unit price, increasing value for new unitholders as well as boosting the yield. We expect total annual returns to be 25.9%, consisting of the current 14.2% yield, 6% EBITDA-per-unit growth, and a 5.7% tailwind from a rising valuation. Investor concerns over Buckeye’s near-term fundamentals have created a terrific buying opportunity in a great company, and total annual returns in the coming years should be very strong.